MONTREAL,, QUEBEC--(Marketwire - May 28, 2009) - Note to editors: Two images are attached to this press release. Looking for a sushi restaurant suggestion in Vancouver? Need a recommendation for a reputable house painter in Calgary? Trying to find a boutique hotel in Montreal? YellowPages.ca(TM) has the Answers. Available at http://answers.yellowpages.ca/, the Yellow Pages Answers Service lets consumers ask questions and get recommendations in real-time for the most relevant local merchants. 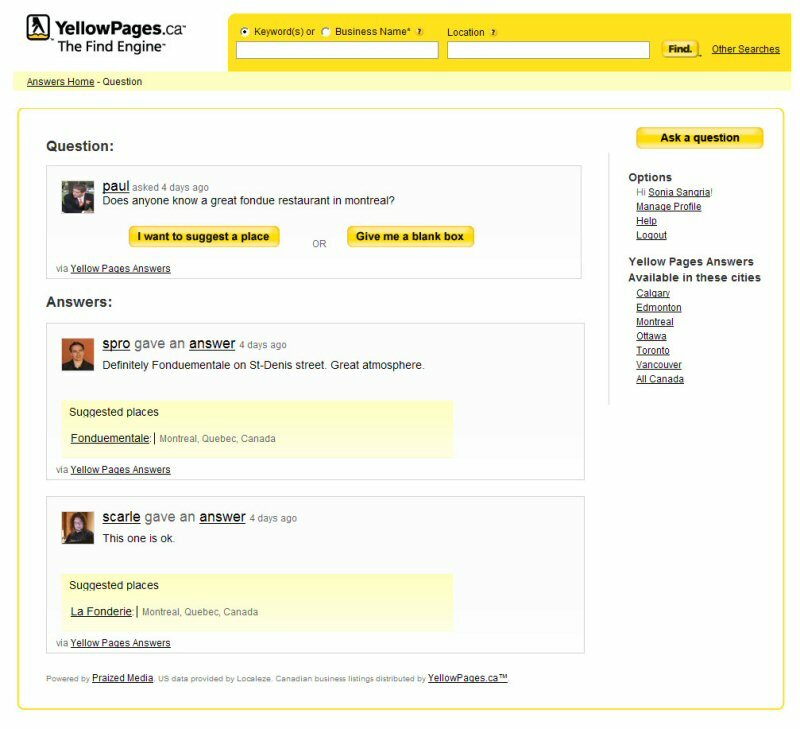 The service also gives users the opportunity to broadcast their questions within their Facebook or Twitter networks with all answers coming back to a unique page that leverages the more than 1.2 million YellowPages.ca(TM) business listings. 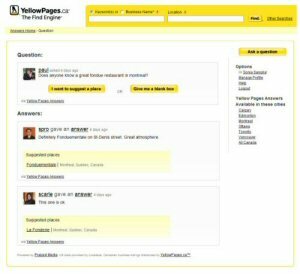 "We are uniquely positioned to offer Canadians an online community where they can ask questions and find locally relevant recommendations from a large pool of consumers in real time," said Jean-Pascal Lion, Vice President - Marketing, Yellow Pages Group. "Consumers have become increasingly savvy and resourceful in the way they search for local businesses and service providers. Our new Answers service provides users with a question and answer environment that is easy to use and will be familiar to anyone that participates in social media activities," explains Lion. While there are many conversations taking place online everyday about popular local business and favorite destinations, the Yellow Pages Answers Service takes the conversation to the next level by providing direct access to local merchant and consumer recommendations. 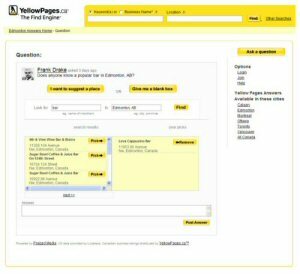 Since launching the Yellow Pages Answers Service earlier this month, users have received recommendations for a wide variety of business and services including restaurants, florists, dentists, mechanics, cosmetic surgeons, wedding photographers and DJs. 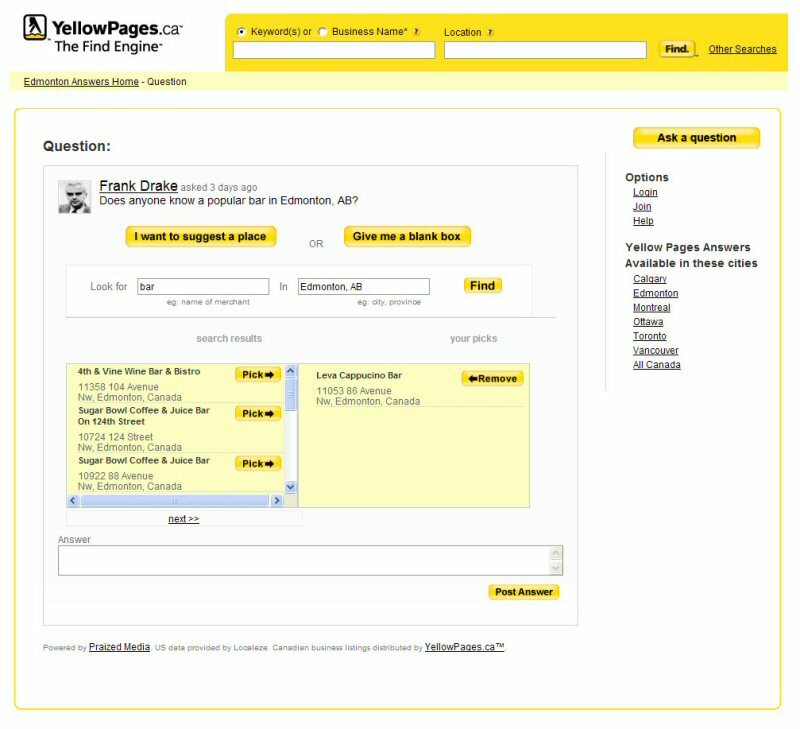 The Yellow Pages Answers Service is powered by Praized Media, Inc., a Montreal-based software company that specializes in social media engagement. Yellow Pages Group is Canada's leader local commercial search provider. It publishes annually more than 340 Yellow Pages(TM) and residential directories. The Company owns and manages Canada's most visited online directories, YellowPages.ca(TM) and Canada411.ca(TM), as well as CanadaPlus.ca(TM), a network of seven local city sites. Yellow Pages Group is indirectly held by Yellow Pages Income Fund (TSX:YLO.UN). For more information, visit http://www.ypg.com/.